Tom Vilsack, Secretary of the United States Department of Agriculture (USDA), views the agriculturally-based bioindustries sector as one of the transformational components of an American economy with a greater emphasis on manufacturing and production, and as an opportunity to address climate change in a creative and innovative way. Secretary Vilsack discusses topics such as the Renewable Fuel Standard, government collaboration with industry and academia, and the USDA's BioPreferred® program in an interview published in Industrial Biotechnology, a peer-reviewed journal from Mary Ann Liebert, Inc., publishers. 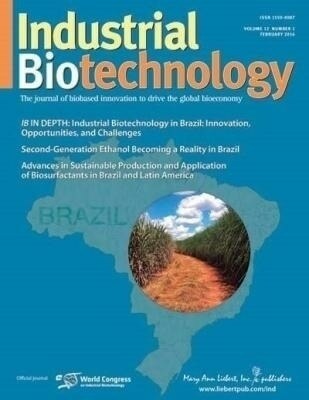 The article is available free for download on the Industrial Biotechnology website until April 4, 2016. The IB Interview entitled "A Conversation with US Department of Agriculture Secretary Tom Vilsack" included discussion of a new version of the Billion Ton study in development by the USDA and U.S. Department of Energy to assess supply and demand of biomass-based feedstocks, the USDA's role in implementing the White House's National Bioeconomy Blueprint, and recent and planned changes in monitoring and reporting of procurement of biobased products by the federal government and its contractors. Secretary Vilsack also responded to questions about the USDA's role in introducing new agricultural plants to support the development of biobased products and materials and bioenergy, and USDA initiatives to promote investments in the U.S. biobased economy. "We are fortunate in this issue of IB to have a leading champion for agriculturally-based bioindustries share with our readers his view of challenges and opportunities facing our industry," says Co-Editor-in-Chief Larry Walker, PhD. "We are very thankful for this engaging dialogue with USDA Secretary Vilsack.